This small hall is part of the temple Mangetsu-Ji 満月寺, Temple of the Full Moon. 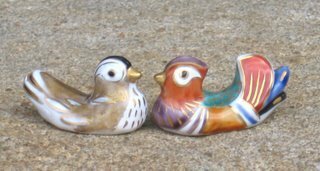 It is part of the artistic tradition of Japan since olden times. I saw a special on TV about this hall last night. They had lit it up with candles only. 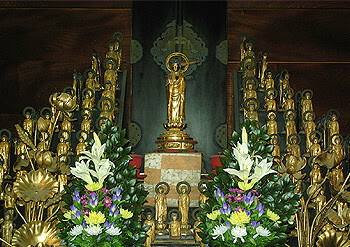 Inside is a statue of Amida Buddha surrounded by 1000 small wooden, but gilded statues. They all shimmered in the pure candle light and seen from a boat a bit afar you could really feel like being in the Buddhist Paradise of Amida in the West. Basho visited Katada in October, 1690 and fell ill.
Japanese sources quote the 16th of August 1691, Lunar Calendar.
. MORE - izayoi hokku by Matsuo Basho . Written in 1691元禄4年8月. Basho age 48. Basho had been invited to the villa of a very rich person named 兎苓 Torei in Katata 堅田. This is a greeting hokku to congratulate his host to his riches. The garden was full of trees with colorful fruit. 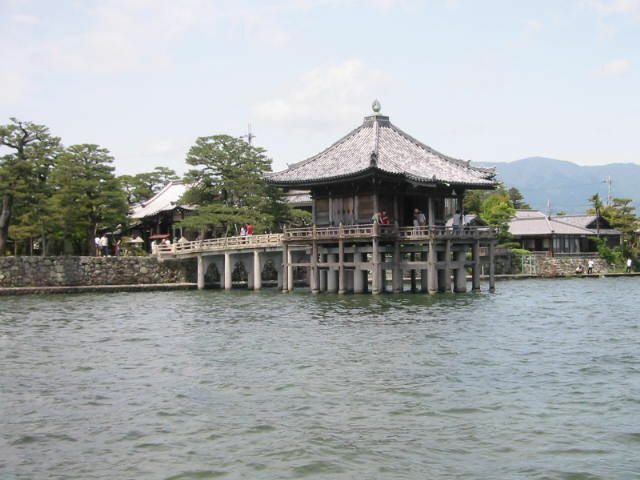 The Hall is said to have been built by the priest Eshin 恵心 during the Chotoku years (995-99) to pray for safety on the lake and the welfare of the people. 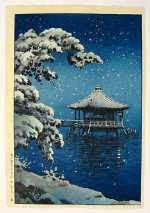 It has been the theme of haiku and ukiyoe prints from ancient days, including a famous haiku by Matsuo Basho. The present Ukimido was rebuilt in 1937, and some details differ from the one in the picture. Went down through the old neighborhood of Katata to the water's edge to visit the Ukimido at Mangetsuji, one of the most subtly beautiful I've ever seen (it's in the Omi Hakkei (Eight Views of Omi (Traditional name for Lake Biwa) 'Katata Rakugan' view by Hiroshige)). 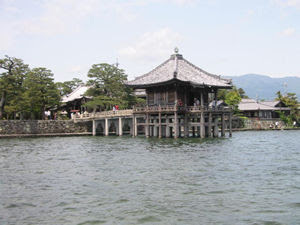 I'd never been to Mangetsuji before, though I'd seen it from out on the Lake, its famous building (the Ukimido) built out over the water on stilts; what a breathgiving place upon entering it; the gate, pines, garden, the view from the Ukimido, the general ambience, bespeak and beget a spiritual peace known too rarely these days; where are the times when one could have envisioned such a thing as this, and then built it? 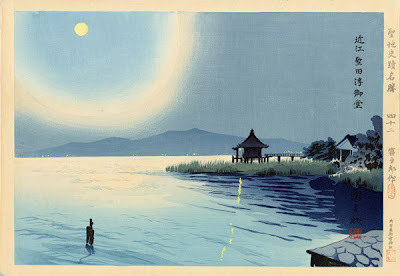 And then as at dusk you walk along the platform around the weathered building, turn, and, with your back to the broad sweep of the sunset water, look into the thus-greater dark of the Ukimido's interior: slowly, dozens of golden Buddhas shine to life in your changing eyes! 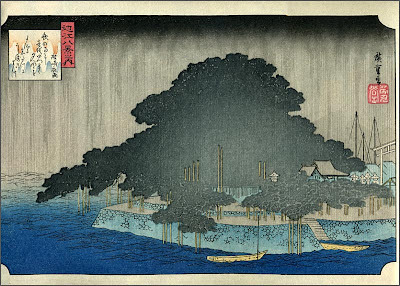 The evening rain at Karasaki (唐崎の夜雨) - Karasaki Shrine. Karasaki ist a small cape with a singele big pinetree, a hitotsu-matsu. The pine has been replaced several times since Hiroshige's times.
. Famous HAKKEI 八景 Eight Views of Japan . He stood in the middle with Mount Hira 比良岳 in the west and Mount Mikami in the east and the herons flying above him. Now there is the gread Biwako Bridge 琵琶湖大橋 right in front of this scene. Mikami san is also called the "Fuji of Omi".
. Matsuo Basho visiting - Gichuuji 義仲寺 Gichu-Ji - .
. Kiso Yoshinaka　木曾義仲 . Minamoto no Yoshinaka 源義仲 and his grave at this temple Gichu-Ji. The town next to the Ukimido Hall, now Otsu Town, Shiga prefecture. 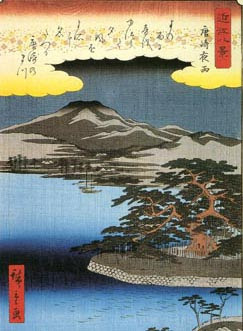 The pines of Karasaki are another of the famous eight landscapes of Omi (omi hakkei　近江八景） Eight Views of Omi Province. In the Karasaki Shrine compounds 唐崎神社 in Otsu City are many old pines, including the one most famous Reimatsu 霊松, one of the three famous old pine trees of Japan. A sprout of this tree is in the famous Park Kenroku-En in Kanazawa (Ishikawa prefecture).
. . . CLICK here for Photos of Karasaki Shrine ! This tree has been planted by Ushimaro no Sukune 宇志丸宿禰 in about 650, when the shrine was used as a kind of hospital for sick women and his wife lay there. He also named the compounds Karasaki. It was called Nokishita no Matsu 軒下の松 (pine tree by the eaves of the house (?nobika no matsu), because it was very small. It is Pinus thunbergii, a Japanese black pine. It broke down during the great taifun in 1581 and has been replanted in 1591, so the tree we see today, supported by more than 350 poles, is the second generation tree. how did they see them?
. Discussing this Hokku - by Chris Drake . At the shrine Karasaki Jinja 唐崎神社 with its famous pine tree. People perform the rituals for the summer purification, like walking through the sacred ring 茅の輪 chi no wa, and floating ritual paper dolls 人形流し hitogata nagashi, to wash away their sins. There is also a huge goma 護摩 fire ritual. It is a very old festival, already mentioned in the Tales of Genji 源氏物語. The mitarashi dango みたらし団子 dumplings are also famous. at the Nanase no haraisho 七瀬祓所 purification plase at Nanase. 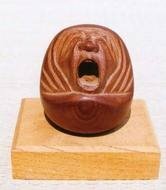 A straw ring amulet to hang in the toilet. It prevents diseases of the lower part of the body, like female problems, hemorrhoides, bladder diseases and more. 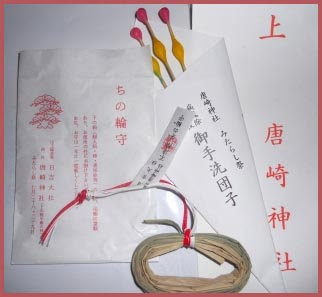 It helps only one year, so you have to buy a new one every year, best during the summer purification festival. This dates back to the wife of Ushimaro no Sukune, see above. Hiyoshi Taisha - Hie Taisha 日吉大社 the Grand Hiyoshi Shrine.
. WKD : Hiyoshi Shrine (日吉大社 Hiyoshi taisha) . The Lake Biwa location is on the entrance road to the Morikami Museum and Gardens. Thank you for your precious information on Biwa Lake. Following your guide, I could enjoy Ukimidoo Gallery that is very wonderful with English. Thank you for the mini pilgrimage & a new dreaming spot. The returning sailing ship at Yabase (矢橋の帰帆) - Yabase. The evening glow at Seta (勢多（瀬田）の夕照) - The Chinese Bridge at Seta. The autumn moon at Ishiyama (石山の秋月) - Ishiyama Temple. The clear breeze at Awazu (粟津の晴嵐) - Awazuhara. The evening bell at Mii (三井晩鐘) - Mii-dera. The wild geese returning home at Katata (堅田の落雁) - Ukimido. waka no toku 和歌の徳 - kishin 鬼神 "Demon Deity"
Once the pine at Karasaki was about to wither but through the power of Waka poetry the Kishin was moved and helped it to regain its lush green color.